At long last, I finally completed the Pansy Bell Pull that has been in my basket of unfinished projects for the past 3 1/2 years! 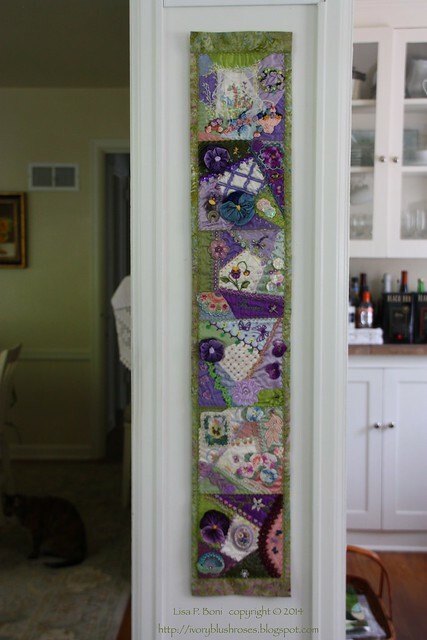 Once I got started on it, it really didn't take long to complete and now it looks so nice hanging on the narrow wall in my kitchen between the doors to the studio and to the dining room! These are the blank blocks that I sent out in May of 2010. In January 2011, this is the set of blocks as I received them home! The top center block was a "group" block on which every stitched a little in addition the complete block that they stitched. I really loved getting back a complete set of blocks! When there is an empty block left for me to complete, it seems to languish in the unfinished project box for far longer! 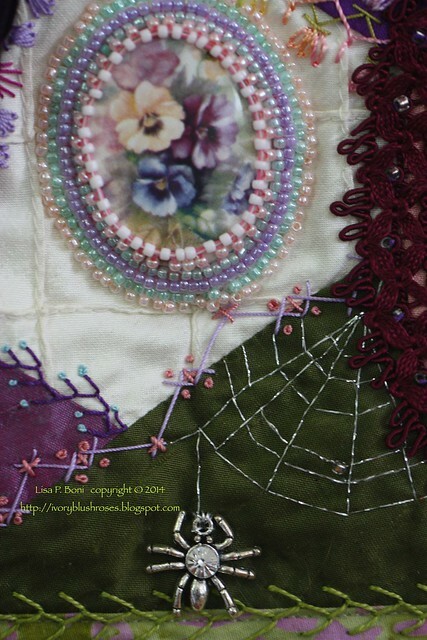 This block was stitched by Cathy LaBath from Iowa. I loved how she turned the tucked silk fabric into a window overlooking a flower garden! This is the group block with bits of stitching by everyone. So many fun little details and having a little bit of stitching similar to what is on other blocks helps to tie the entire group of blocks together. 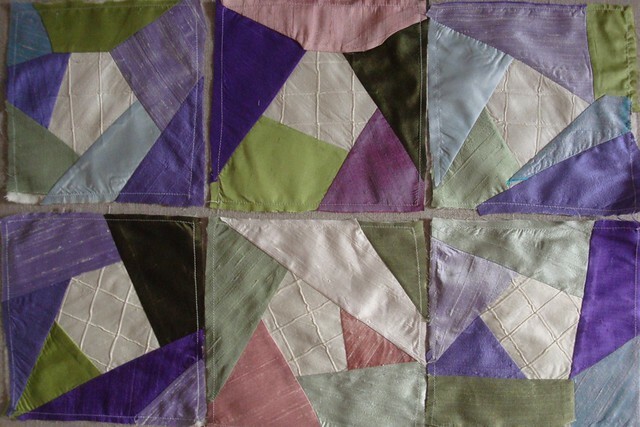 This block was stitched by Carolyn Phillips from Georgia. 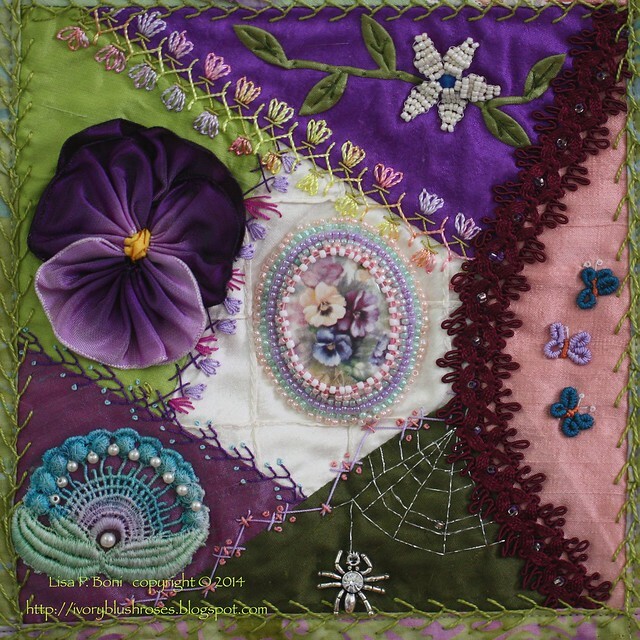 I love being in round robins with her as her stitching is exquisite! 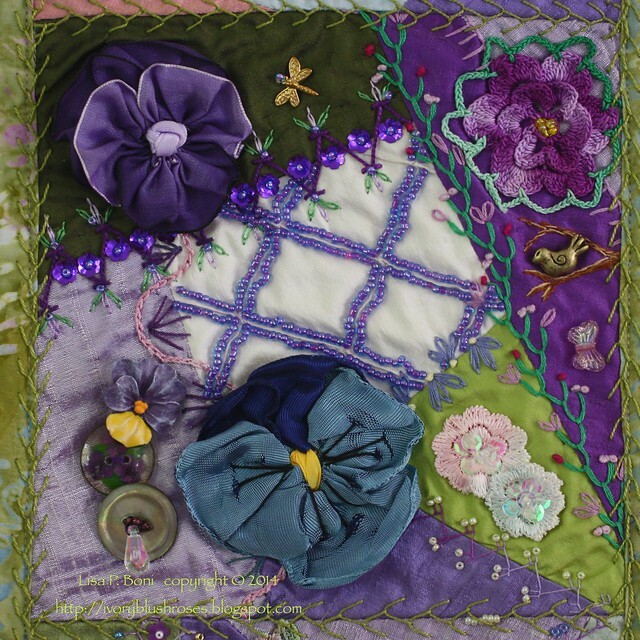 This block was stitched by Arleen White from Australia! 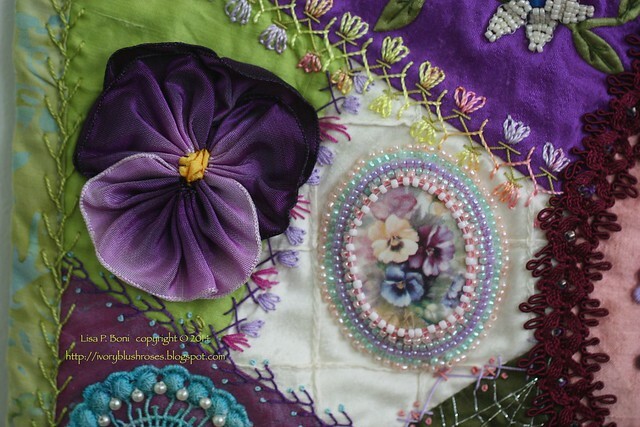 I love her buttonhole stitched butterflies! And that little spider in the bottom corner? I can't tell you how many times I picked this block up and jumped back thinking there was a real spider on it! The photo doesn't do it justice. 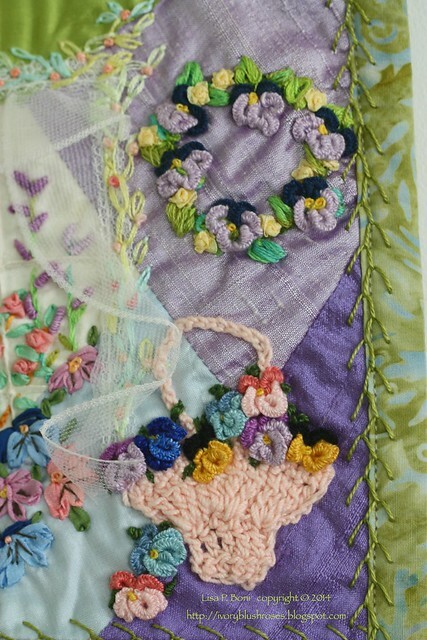 This block was stitched by Alice Topp from Wisconsin. This was a tough block to stitch because the colors were rather pale and washed out compared to the other blocks, but she did a great job of helping it blend with the others! 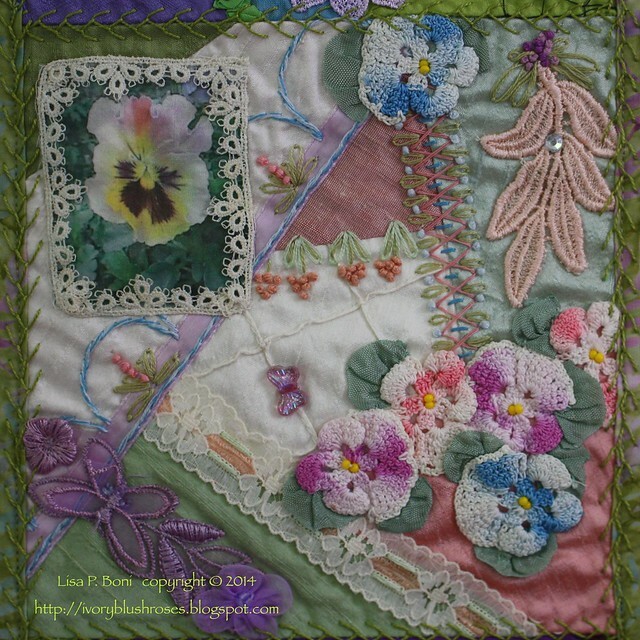 Kerry Leslie of Canada stitched the last block. 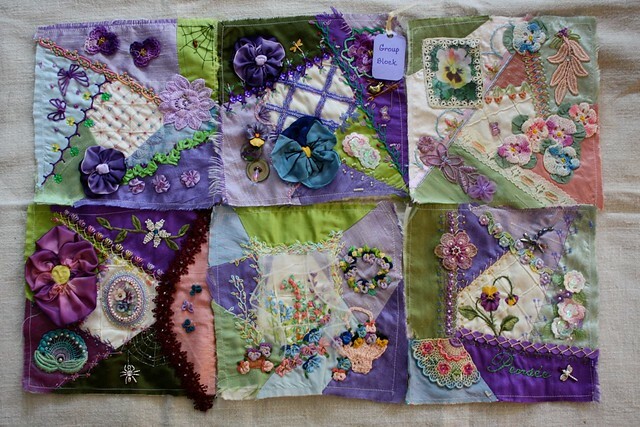 She does beautiful stitching too and I just love those bullion stitch butterflies on the right! This block did have an "issue" though that I had to fix before completing the bell pull as you will see in the next photo. Kerry including a sunny faced pansy with a clay face for the center. It was glued together and unfortunately did not hold together in mailing. The back of the face had also cracked and was loose from the block. 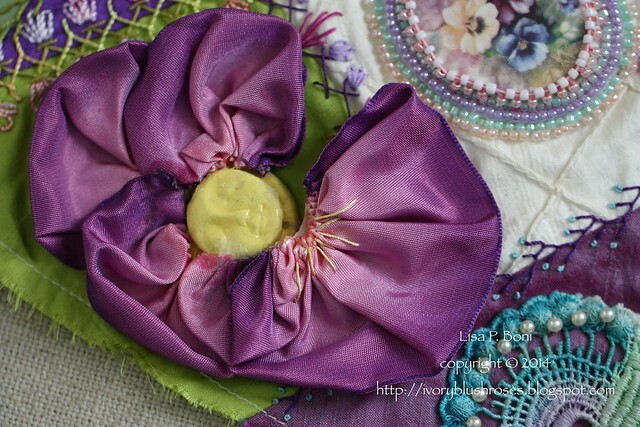 I had hoped to reuse the ribbon to create a new pansy but when I pulled it off, it was so saturated with glue that I ended up having to discard it. I made a new pansy to take its place out of some wired ribbon in my stash. I wish I'd had some with that pinkish edge to it, but this one came out well. The lovely beaded cabachon in the center was also fairly heavy compared to the other blocks, so this block ended up at the bottom to keep it from buckling. Kerry also included a fun glitzy spider and web on this block! A closer look at some of my favorite details from these blocks. 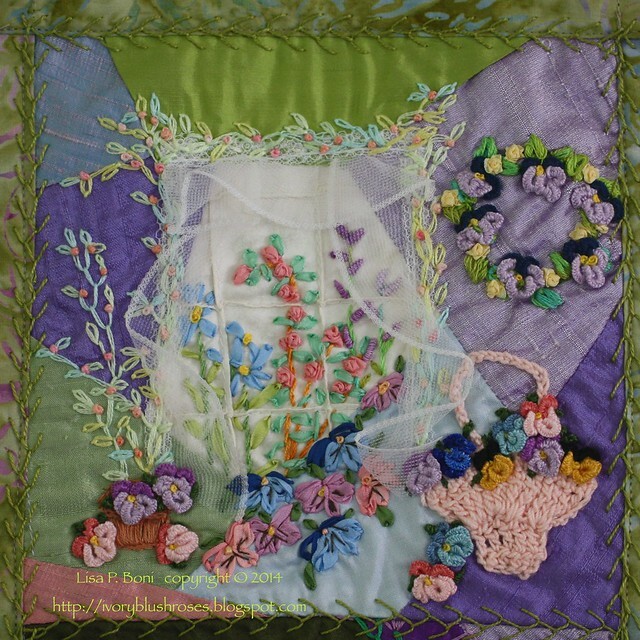 Cathy's window of flowers is just lovely! 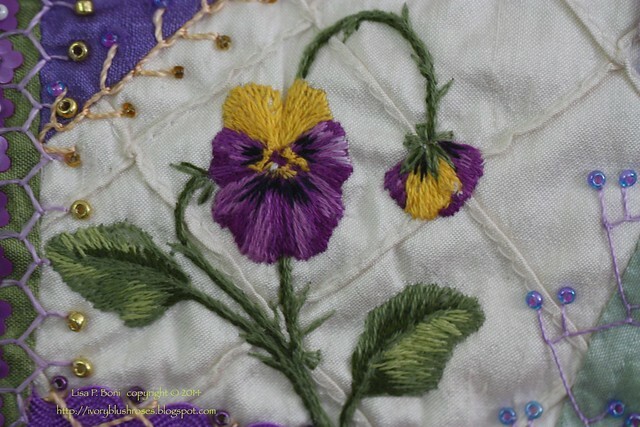 Her block is filled with these amazing little cast-on stitch pansies! I just love them and I'm going to have to try making some of the these myself! The group block has this sweet bird bead sitting on a branch! Makes me smile! 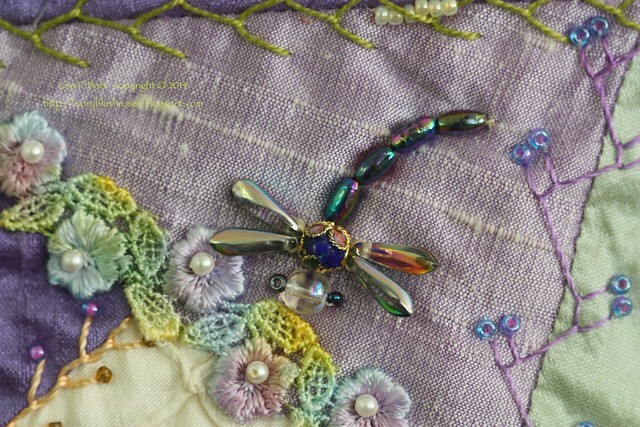 Carolyn included a lovely beaded dragonfly! The cloisonné bead that she used for the body is just perfect! 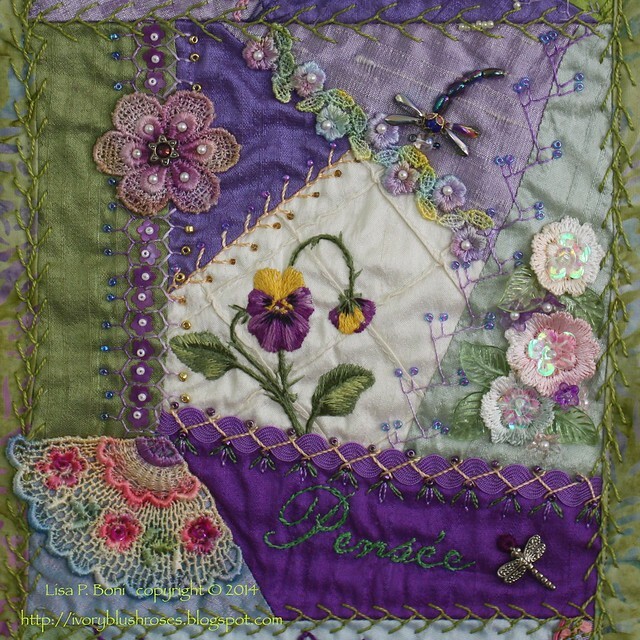 Her exquisitely stitched pansy is probably my favorite element on all of the blocks! Just beautiful! 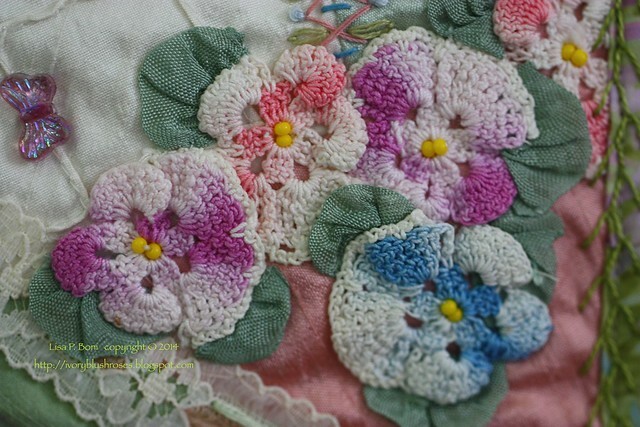 Arleen included some lovely crocheted pansies on her block that I think are vintage! They are beautiful! I used a lovely batik fabric to back the bell pull. It picked up all the colors from the blocks without overwhelming the lovely work that everyone did. I used feather stitching all the way around each block. 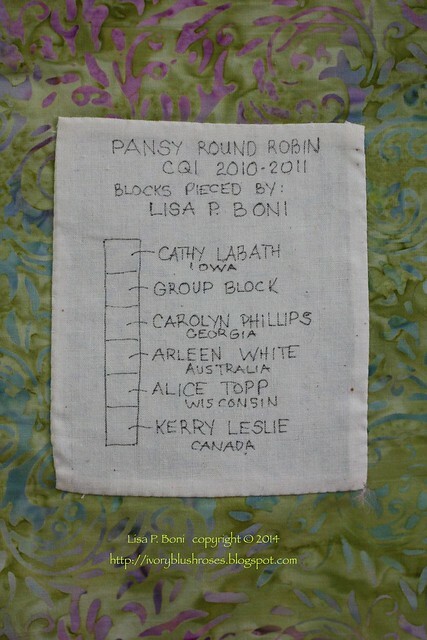 On the back, I put a label showing who stitched which block and where they were from. This really was an International Round Robin! It was definitely one of my favorites to stitch in and resulted in some of my best work. It's great to have this finished and hanging on the wall where I can enjoy it! This is truly inspiring. I've been following your blog and always marvel at your stitching techniques. I love them all. 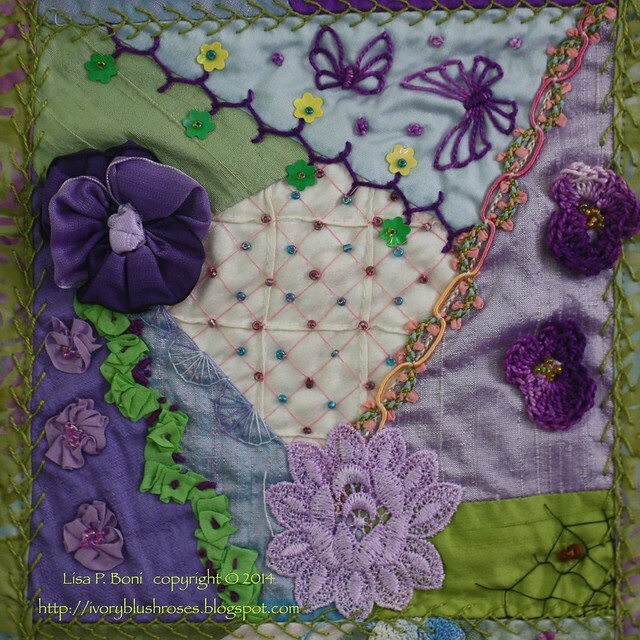 Violet and green, always one of my favorite combinations. And Pansies a favorite too. It was fun to see what others have done with your CQ blocks, and that their work was something you wanted to display in your home. When you piece the blocks together I'm sure you have in mind what you'd like to get back, and that you surely get some surprises that you were not expecting! I would not have thought to add spiders, but after my day in my garden realize they were a great choice! I love pansies! This was a beautiful RR. 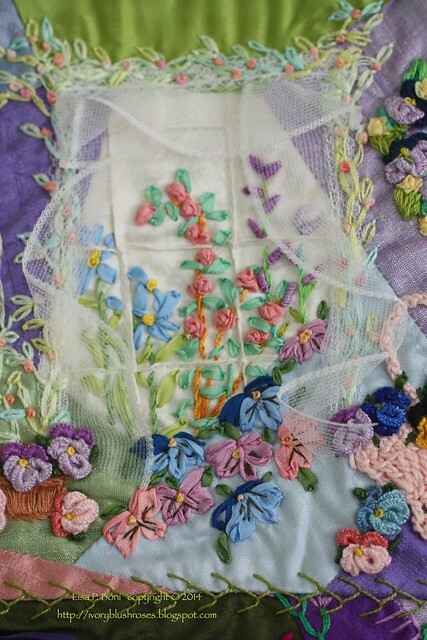 I especially love how each stitcher interpreted the center patch with the tucked square fabric. Your finish is just wonderful and you've chosen a spectacular spot for it in your home! Very nice RR !!! Magically !!! I love your blog !!! Oh Lisa, they all look so good together. I've finally made up one of my blocks into a box. So glad they are all together. 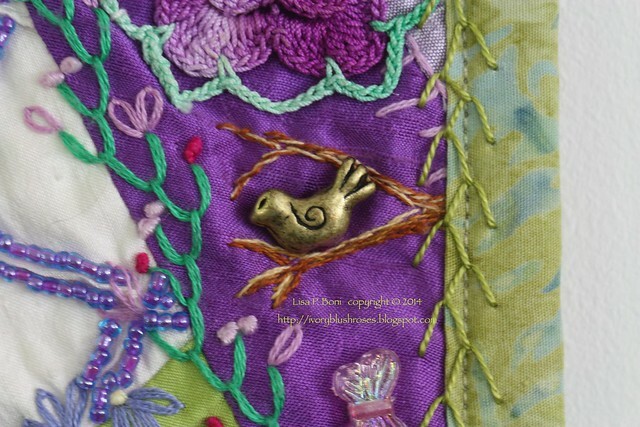 Exquisite stitching....I'm new to your blog and find your work amazing! Great finish Lisa - good for you! Sorry my pansy was trashed in the mail but yours is a huge improvement on it anyway! You make the most beautiful pansies! This was wonderful! What a beautiful way to show all the blocks and everyone did a beautiful job. Very nice !!!! very good!!! Every one of them are exquisite! What a wonderful thing to be able to do. 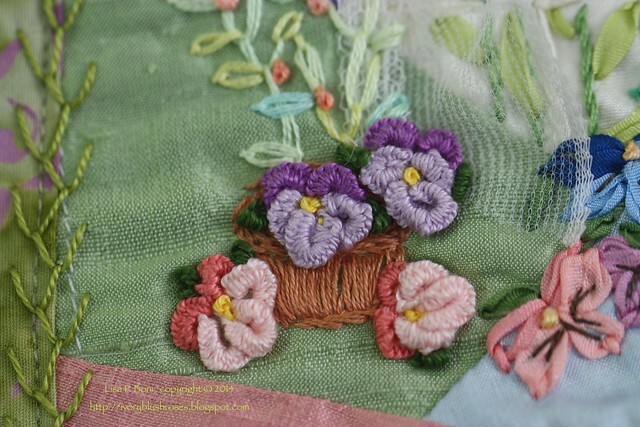 Embroidery seems to be a dying art very much worthy of saving! Lovely bell pull, great pumpkin pin cushion and I keep failing to comment on picture of you in your studio. You look so happy and content.